Siegfried De Buck | Jewel designer & silver smith. 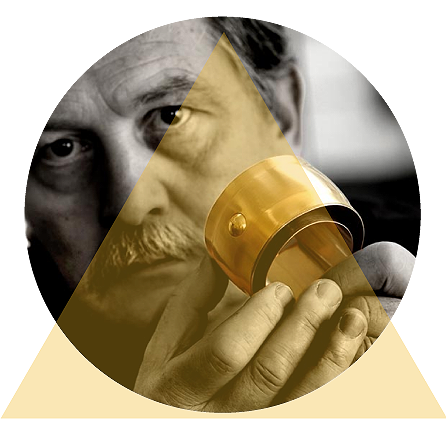 As one of the pioneers of contemporary silversmithing, Siegfried De Buck plays an important role in the development of the silversmith’s trade in Belgium. His creations range from jewelry to tools for daily use such as walking sticks, teapots or table tools. A strong personal artistic vision and excellence of workmanship are characteristic of his work. Technique and elegance are put on the forefront. His creations show both a very personal way of expression and a thorough knowledge of material and technique. The result is an oeuvre which shows strong personality and artistic talent. Siegfried De Buck is particularly attentive to materials and he likes to exploit their different features. The combination of different substances, particularly gold with non–precious materials is distinctive of his work. According to Siegfried De Buck, the perfection of the silversmith reveals itself in the end product. He therefore always assumes full responsibility for both design and realization of his creations. His technical expertise,willingness to explore materials and desire to look for new possibilities led to many inventive creations. One of these new techniques was the invention of a new welding technique, TIG, now widely used in the silversmith profession. bracht de RTBF in 50 Degrès Nord volgende reportage uit. "Siegfried De Buck: Overzichtstentoonstelling: Juweelontwerper en zilversmid"
29 euro (excl.verzendingskosten) te bekomen. Siegfried De Buck : A general view: Jewel-designer and silversmith. Overview contemporary jewelry and silver objects from the past 38 years including a focus on 60 rings. Friends, old-students and artists were invited to create an item around the ring. Publication "60 Rings" with 60 photos from rings made by Siegfried De Buck (MER edition - Luc Derycke) and an edition of a ring "Pavillion II" . Contest within the texts of the publication "60 Rings" If you read attentively you can find the instructions to the hiding-space of a golden ring made by Siegfried De Buck. Interview Siegfried De Buck, gouden handen en een vurige geest.